Analytical Power - Utilizing the ExcelSavvy optimized performance engine, this tool will map and compare workbooks, report risky areas, problems and provide tools for use on even the largest of Excel models. Speed - ExcelSavvy 2.0 works faster than ever before; the state-of-the-art analytical engine can perform thousands of calculations and checks per second. As a result most ExcelSavvy reports are produced in less than a minute. Flexibility - The XP environment (which can be customized for 2000 by request) allows modeless forms to be used which allows flexibility and multitasking. The ExcelSavvy reports can be customized to your company name which saves endless administration especially in large auditing environments. User Friendly - ExcelSavvy allows the user to customize the colour palette for the ExcelSavvy reports as well as specify hot keys with the ExcelSavvy utility tools. The ExcelSavvy website has a complete user guide available to answer all concerns. 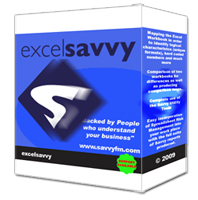 Integration - The ExcelSavvy engine is compiled in VBA code as a Microsoft Excel Add-in. This will integrate seemlessly into the corporate or single user PC environments. Risk Management - ExcelSavvy instantly highlights the dangers and risks associated with modelling. As a result risk management is easily controlled with the suite of ExcelSavvy reports. Risk Evaluation - By using the ExcelSavvy suite of reports as part of your modelling solutions you will gain experience in evaluating the many the risks associated with financial modelling. Proven Technology - The ExcelSavvy engine has been developed by a team of modellers from a banking, accountancy and computer programming background. The technology has been tested in the corporate arena over a number of years and is a particular favourite of many major financial institutions. Cost Efficiency - ExcelSavvy is easy to use with a clear logical structure and point-&-click intuitive interface which accelerates the user's learning curve and reduces the hidden costs associated with in-house development or the use of less evolved, financial modelling tools. The ExcelSavvy engine performs calculations that are compariable to an army of analysts but without any risks associated and in a fraction of the time.